The companies and communities of the Pacific Northwest wonder what took everyone so long. 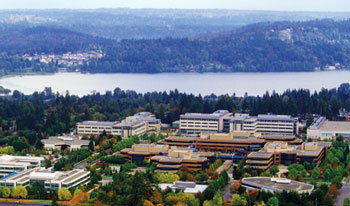 Microsoft's Redmond Campus, viewed from the west with Lake Sammamish in the background, continues to deepen its footprint, the epicenter of a Puget Sound employment base of 36,000. On Nov. 12, Microsoft Corp. unveiled its new headquarters for Microsoft Research, one of seven new buildings on the company's West Campus in Redmond, Wash. Those edifices are part of 1.4 million sq. ft. (130,060 sq. m.) of the campus currently under construction, planned for completion in April 2009, that includes a bookstore, a min-spa and 12 food venues. Oh, and the company also announced it was doubling the space investments in Redmond well beyond its 2006 plan. "The physical campus growth the company announced today underlines our investment in Redmond and the greater Puget Sound area and shows our commitment to our future," said Chris Liddell, chief financial officer at Microsoft and the executive overseeing the expansion. "Continuing to build a world-class campus in Redmond is critical to a company like Microsoft that has innovative people as its greatest asset." Microsoft is also performing site planning for two new buildings on the former Safeco Corp. headquarters site it acquired in 2006. The company will also begin site planning for the addition of new buildings on the land it acquired from Nintendo of America Inc. earlier in 2007. Both of these projects are outside the three-year expansion Microsoft began in February 2006. Meanwhile, the company is investing $35 million in transportation and other infrastructure projects in Redmond. "The fact is, Microsoft is and continues to be a mainstay for Washington's economy," said Washington Gov. Chris Gregoire. "Not only does it create and support thousands of high-wage jobs, but it also generates enduring prosperity. It serves as a magnet for other software and high-tech companies in Washington. And many former Microsoft employees have tapped their wealth and know-how to start new business enterprises and charitable foundations." Microsoft employs more than 36,000 in the Puget Sound region and another 46,000 globally. n the Pacific Northwest, economic developers and the companies they keep were clean and green before it was hip. Just ask the dozens of companies that thrive off Portland's bicycling scene alone. The rest of the world is trying to catch up. A November proposal from the U.S. Trade Representative and the European Union, released prior to the Bali Climate Change conference, called for an environmental goods and services agreement among WTO nations that would largely eliminate tariffs on clean technologies and services. Global trade in the environmental goods covered by the U.S. and EU proposal totaled approximately US$613 billion in 2006, and global exports of these goods have grown annually by an average of 15 percent since 2000, said the trade office. The World Bank says removal of certain barriers could increase trade by an additional 7-14 percent annually, with the benefit that countries trading in such technologies tend to have less pollution and more efficient energy consumption. Clean technologies and the mindset to both employ and trade in them are both in robust supply in Oregon and Washington. That supply increased in late November when Santa Clara, Calif.-based photovoltaic (PV) silicon wafer manufacturer Solaicx opened a new manufacturing facility in Portland, Ore. Located in the Portland RiverGate Industrial District, the 136,000-sq.-ft. (12,634-sq.-m.) plant opened with 100 employees and output measured at 32 megawatts annually, but will gradually increase to 180 employees and 180 MW. The Solaicx project follows the large SolarWorld project that came to the Portland area earlier in 2007. In early November, another one came to light in Millersburg, where Peak Sun Silicon will make granular, electronics-grade silicon. It hoped to complete incentives negotiations with the state, city and Linn County and break ground before 2007 was over. Charlie Allcock, director of economic development for Portland General Electric, fielded his first query from Solaicx in early January 2005. He says his efforts in helping attract such firms as Solaicx and SolarWorld are enhanced by state policies that include a stringent Renewable Energy Standard (25 percent by 2025, one of the most aggressive in the U.S.), and a Business Energy Tax Credit for both energy-efficiency measures installed by businesses, and for businesses manufacturing renewable energy equipment (solar, wind, biomass, etc.). That credit was boosted in 2007 from 35 percent to 50 percent. It's just part of the sustainability matrix that currently carries the day in the region. Allcock cites the fact that Toyota Prius hybrids sell in Portland at twice the per capita rate as the next highest-ranking community of Prius buyers. "My sense is that west of the Rockies is one world and east of the Rockies you find pockets of sustainable focus," he says. "In a lot of other places, I find it pretty hard even to recycle a Dasani bottle." 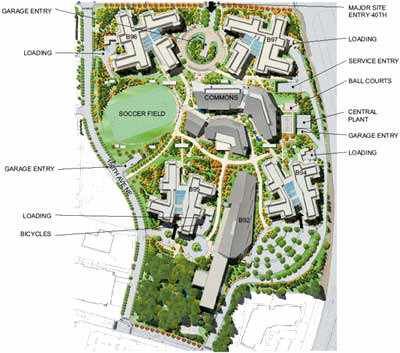 The plan shows new buildings and structures, purchased buildings, and existing structures across the Redmond headquarters. Image courtesy of Microsoft Real Estate and Facilities and Callison. Allcock says the bleeding edge of California's aggressive/progressive environmental policy is part of what makes Oregon cutting edge. "They have enough mandates that it's really creating a market," he says. "What we're seeing is the companies looking to manufacture for the California market are looking at states near California if they don't want to be in that state. California is a very popular place to live and work. But when you need lots of space and want to manufacture, it's an expensive place." But as Oregon lives off the "easy sell" as an environmentally sustainable place, he says the business case still has to be made. Right now that case hinges on speed to market. "Depending on whom you believe, they'll say markets are growing from 30 to 40 percent a year on up," he says. Allcock says a shift is under way, supported by a robust power system put into place for one industry, but now supporting others – including some that will factor into PGE's own facility mix. "The solar industry coming here is based on the intellectual property and work practices of the semiconductor industry," he says. "So we're watching a really interesting industry transition occur." Portland General Electric has come out early in support of a federal program to address carbon emissions and an associated credits trading program. Its own facility plans range from a new gas-fired plant to a new wind farm in north-central Oregon and solar. But there is one other sector with a power unique to Oregon. "We have the Oregon coast, which has been identified by EPRI [Electric Power Research Institute] to be one of the best places in the western U.S. for ocean energy," he says. "They have some test buoys, and there are Oregon companies looking to manufacture that." Those efforts received a boost on Nov. 30 when the Federal Energy Regulatory Commission announced it would issue conditioned licenses for hydrokinetic energy projects, which include those using currents, waves or tides to generate renewable electric energy. Such licenses will "improve the ability of project developers to secure financing of demonstration projects," FERC said. FERC had help finalizing its policy at an October technical conference – held in Portland. When Forbes in summer 2007 ranked Washington as the fifth-best state for business in the U.S., the Evergreen State not only was the biggest upward mover in the nation, but the only state to make the top five in three categories: labor, regulatory environment and growth. According to Conway Data's New Plant Database, the corporate industrial projects backing that meteoric rise have come in sectors ranging from fruit, wine and other food sectors to silicon, biofuel, renewable energy and, of course, the aerospace cluster led by Boeing in the Seattle area. Project numbers have been rising, and so has the proportion of manufacturing. 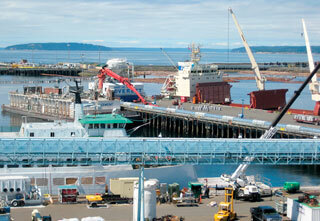 Portland, Ore.-based Greenberry Industrial performed the conversion of the Port of Everett, Wash., from a focus on alumina ore to a focus on cement, following the port�s 2006 contract with Lehigh Northwest Cement Co. to use the Port's existing bulk facility to handle approximately 500,000 tons of cement each year. The award-winning project was completed in August 2007, culminating a rapid eight-month schedule. of "boomtowns," based on job growth patterns, driven in part by strong hiring at Boeing and Microsoft. Seattle's industrial profile could improve even more if Mayor Greg Nickels' Industrial Jobs Initiative sees its way to fruition. Proposed in late August and supported by a majority of the city council in mid-December, the measure seeks to implement land use measures to preserve an industrial economy that generates more than $31 billion annually and more than 120,000 industrial jobs, paying $55,500 annually on average. • Reduce allowed office and retail uses in Industrial General zones from current maximums of up to 100,000 sq. ft. (9,290 sq. m.) of office and up to 75,000 sq. ft. (6,968 sq. m.) of retail to a maximum of 10,000 sq. ft. (930 sq. m.) per site for these uses. • Reduce allowed density for office and retail uses in Industrial General zones from 2.5 Floor Area Ratio (FAR) to 0.5 FAR. • Clarify the definition of research and development in the land use code to ensure the continued growth of R&D laboratories in industrial areas. • Consider changes in zoning designation for industrially zoned sites along the edges of the industrial centers (Duwamish and Ballard/Interbay Manufacturing and Industrial Centers), and industrially zoned sites not in the MICs. • Allow Starbucks to expand its existing headquarters in the Duwamish MIC with potential for increased FAR. As the city council considered the plan's multiple planks in mid-December, one separate project got the provisional go-ahead: a plan by Vulcan, the development firm of Microsoft co-founder and Seattle sports franchise owner Paul Allen, to build three office buildings in the city's South Lake Union area for the expected relocation of a major headquarters which would involve 4,000 employees. Most parties believed that company to be Amazon.com, which Vulcan confirmed in late December. Among the stipulations in the city council deal: a $6.3-million commitment by Vulcan for affordable housing in the area.